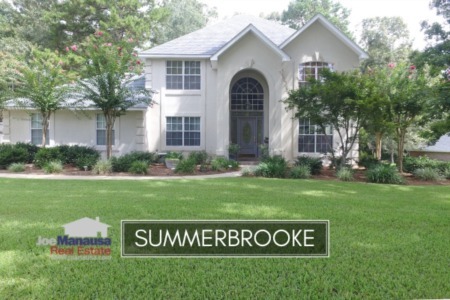 Summerbrooke is a Northeast Tallahassee golf course community that offers larger homes, well apportioned lots, and access to A-rated schools. 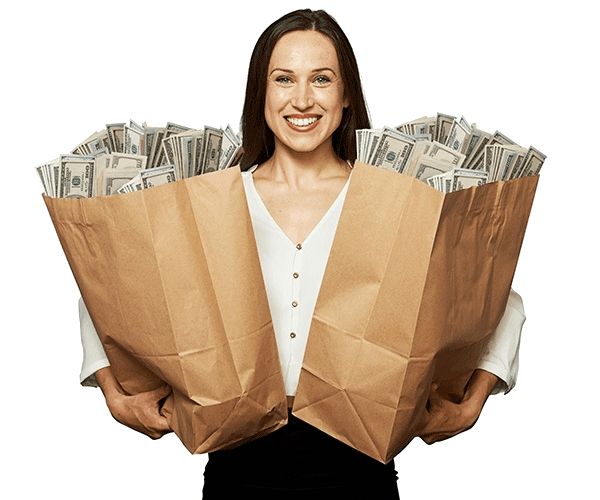 Home prices are still highly attractive here, and when combined with low interest rates, one can still find a steal of a deal on a home in Summerbrooke. 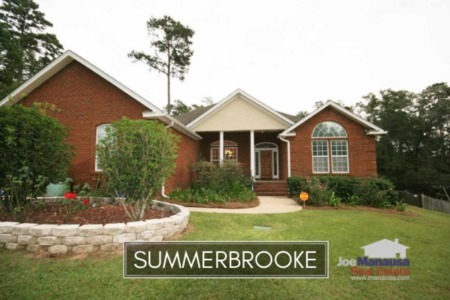 Our past reports on home sales in Summerbrooke have shown this to be a very stable neighborhood, and we expect its popularity to increase due to the added retail shopping and dining in the Bradfordville area. 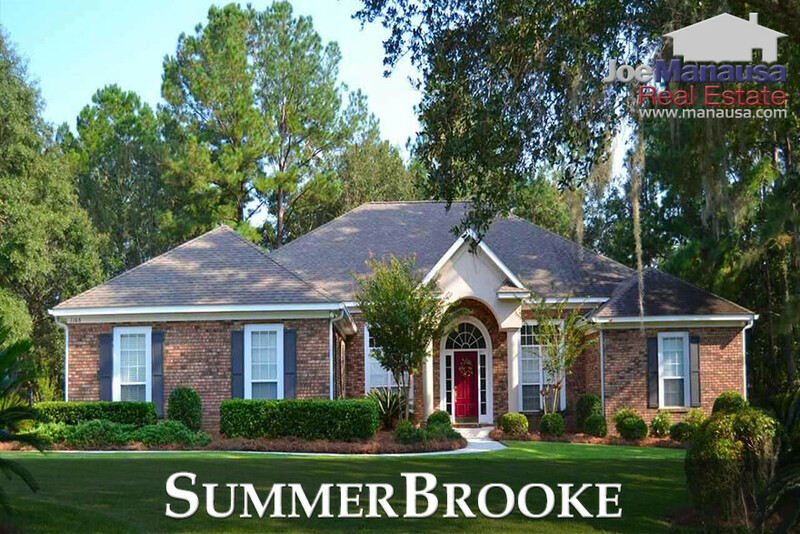 Buyers continue to tell us they favor the A rated schools here (Hawks Rise Elementary, Deerlake Middle School and Chiles High School), and we have buyers standing by for good inventory in Summerbrooke. In this report, we have included graphs of average home prices, home value trends, and home sizes in Summerbrooke, as well as all closed home sales going back to 1991. It is important to note that the narrative contained below is for sales through December for all previous years, but through the 7th of December in 2017. The graphs and the closed sales table will be continuously updated into the future (meaning bookmark this page if you always want to know the current status of homes in the Summerbrooke). The average recorded home price for Summerbrooke in 2017 has been $375,600, which is 17% higher than last year's average. The word is out on this popular NE Tallahassee neighborhood, and prices are quickly recovering. Activity in Summerbrooke has been healthy this year. Buyers are jumping all over homes that are marketed properly, and good listings do not last. Currently, there are 16 homes for sale in Summerbrooke, and 9 are already under contract (more than half are already gone!). Average home values in Summerbrooke have shot up stronly this year and now sit only 11% below the peak of the market values recorded in 2006. As of the 7th of December, the average value of a home sold in Summerbrooke has been $140 per square foot. This is up more than 8% when compared to the average recorded last year. The average home size sold in Summerbrooke typically falls in a range of 2,400 to 3,200 square feet, and 2017 has offered no surprises. The 34 home sales in 2017 have averaged 2,682 square feet. The following list shows the most recent 1,000 home sales in Summerbrooke. This concludes our December 2017 update on home sales in Summerbrooke, please feel free to give us a call at (850) 366-8917 or drop us a note if you have questions not covered in this report.